This is the third generation of Bailey's mid-market range and benefits from a decent make-over with a new exterior and equipment. Bailey used its first Pegasus range to launch its Alu-Tech bodyshell construction in 2009, a method that gave the van a small front locker with room only for the gas bottles. An on-board water tank supplemented the Aquaroll, and big features were safety and security with the Al-Ko ATC anti-snaking system and AKS stabiliser, plus the Tracker Monitor Stolen Vehicle Recovery System. Series II was given more showroom appeal following the successful launch of the top of the range Unicorn. The interiors were made more inviting, but kit levels were reduced, reflected in the cheaper price. 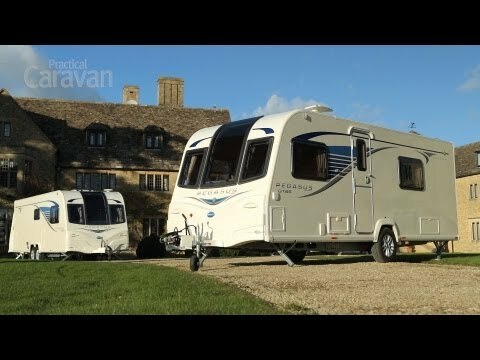 The Pegasus Series II Ancona took the Best Caravan for Large Families gong in our 2012 Tourer of the Year Awards, but it was the new, fixed-single-bed Rimini with rear washroom that became a range best-seller. Equipment levels have been improved, with Bailey extending its use of Michelin-branded tyres from the Unicorn to the Pegasus with alloy wheel security locking nuts and a portable wheel lock. It also has a wind-down, underfloor spare wheel carrier for easier access. A narrower body, a striking vertical roof window, integrated front and rear bumpers and the gas locker moved to midships, in front of the axle, mark the exterior evolution of the Pegasus. It sits on an Al-Ko galvanised-steel chassis and is equipped with Al-Ko’s ATC and hitch stabiliser. We towed it behind our Honda CR-V, an easy 80% match, and it behaved very well. Once in position, we set about hooking up the amenities and lowering the steadies, which are the heavy-duty variety. Finding the nuts for the front steadies is easy enough, but you’ll need to feel around beneath the light clusters to find those at the back. The gas locker’s relocation to the offside, just in front of the axle, has reduced the van’s noseweight from 74kg for the Series II Rimini to 61kg for the GT65 edition. That’s some saving. The locker, which will accommodate all types of cylinders, is at a sensible height, too, making its contents easily accessible. The two front side lockers have been retained and deepened, and are handy for bits and bobs, but are small for Aquarolls. TV viewers will like the aerial point for a satellite dish connection as well as the directional TV aerial, and there’s provision for a solar panel connection. There’s further innovation within, most notably in the heating and water heating systems, which are both by Whale and are managed by a wireless touch-screen control panel just inside the two-piece entrance door. The space and water heaters are mounted under the van so they don’t impinge on living space, and use both gas and electric. Both systems can be programmed via the control panel, which also lets the user know how much amperage each system is using. Clear diagrams for each facility make it easy to use. The van has just four blown-air vents, but with both power supplies in use it seemed to warm quickly. The vertical window lets in plenty of light and gives you a view unfettered by lockers. Blinds for the window meet partway, so you can lower the top half to block out glare from the sun if required, and raise the bottom half for privacy. This van's interior space looks sleek and modern, with walnut cabinet work, including a panel connecting the vertical window with the rooflight. The soft furnishings are comfortable and neutral in tone – it's a look that is modern and easy to live with. With no gas locker impinging on space at the front, the two-drawer centre chest is recessed under a wide shelf at the base of the front windows, allowing more legroom for people sitting on the sofas. The narrower body is not noticeable when lounging. However, with the free-standing table set up, space is a little tighter. The seating has been lowered slightly, though, which makes it easier to slide in around the table. If there are just the two of you, the centre chest’s large pull-out tabletop is just the job for a couple of plates and glasses, and there’s plenty of space on the shelf for books and other bits and bobs. The fusebox is in a cupboard below the drawers and is easily accessed. A large rooflight, three front windows and one on each sidewall light the area by day. For night-time illumination, two LED lights sit between the vertical window and rooflight, and four spotlights are at the corners, but there's no mains light. In the front corners are large shelves rather than lockers and the space behind the shelves is occupied by speakers. On the nearside is the radio/CD/MP3 player with iPod connection point. The midships, L-shaped kitchen delivers a certain amount of ‘wow’ factor as you enter the van. The arrangement accommodates the intrusion of the gas locker into the interior space, with a circular sink above the locker and a shallow cupboard, housing a cutlery tray and two shelves, flanking the front. on washing-up duty may need to watch they don’t slosh water on to the worktop that might then drip on to the upholstery. Worktop space is good and the detachable drainer can be tucked away or fitted over the circular sink when not in use, so there’s space for food preparation. The new dual-fuel hob has three gas rings and an electric hotplate – the oven and grill are separate and there is a microwave on the opposite wall. The latter is at a sensible height, with a roof locker above and workspace that doubles as a TV stand below. Underneath is a large cupboard. Doors to the three cupboards above the kitchen area open out and there’s LED lighting above the worktop but none above the hob. A window and a small rooflight illuminate the area by day. The Rimini’s rear washroom is compact but comfortable and has nearly everything you need: a separate shower, large wardrobe, domestic-style door and swivel cassette toilet. The roomy shower unit has a domestic-style showerhead and a centre panel incorporating sections for shampoo bottles and soap. It could do with a hook or a pole across the unit for hanging wet gear, though. There is no surface around the basin to put anything but there is a toothbrush mug above the basin, along with a mirror and a cupboard. The towel ring is on the door. Above the Thetford C-260 toilet is a toilet roll holder and a non-frosted window, so you’ll need to lower the blind for privacy. Daylight seeps in via the small rooflight in the shower. A large wardrobe occupies the offside wall next to the toilet. Inside is full hanging space with a shelf above, and the large cavity below is useful for bulky items. The toilet cassette is accessed via the rear wall panel because of the way the vans are designed and built. This makes for a more flexible washroom floor plan. A concertina partition separates the sleeping area from the rest of the caravan. This is where the narrower body is more noticeable. The twin single beds are comfortable but, at 0.69m, they are not especially wide. They will accommodate slim six-footers though: one bed is 1.83m long, the other 1.91m. Each bed has a small corner shelf above it for a cup, a book or glasses. The gangway between the beds is 27 inches wide. Up front, Bailey has abandoned pull-out slats in favour of a beech and aluminium slide-out frame to make up the double bed. Cushions are arranged to form a mattress without impediment from the recessed centre chest. Storage is sufficient for two people. There are three lockers and a small shelf above each bed, plus the wardrobe should dispatch clothing with ease. The offside bed has ample space below for bulky items, but the nearside bed is where the table is stored, making it awkward to get at. Fortunately, the table isn’t heavy. This storage area is also accessed from the outside and could be used for wet gear, so having the table stored here is not ideal. A gas strut supports each bed base. The kitchen storage options should easily deal with crockery, pans and store cupboard essentials. At the front of the van are two roof lockers and a large shelf on either side for additional paraphernalia. Access to storage space under the front nearside seat is via a small flap at the front or by lifting the seat base. There’s a small shelf above the entrance door for keys and a torch, but coat hooks would be welcome, because there is nowhere to hang damp outer garments. The fixed-twin-single-bed layout is one of the most popular on the market for couples and all the mainstream manufacturers have a version of it. The Rimini is a fairly streamlined interpretation, carrying good equipment with some interesting design solutions, such as the midships gas locker and the resulting kitchen layout. Coat and towel hooks would be useful additions. There is nowhere to hang your coat except in the wardrobe, which isn’t ideal if it has been raining. The reduced weight will appeal to caravanners looking to upgrade their van but not their car – and there are comparable vans on the market. The Bailey’s nearest rivals are the Swift Challenger (and Sterling Eccles) Sport 564, which have comparable kit levels, are £650 cheaper and 24kg lighter. What might clinch it for Bailey is the Alu-Tech construction with GRP skin sidewalls, rather than aluminium, the wind-down spare wheel carrier, the Michelin tyres and alloy wheel security locking nuts, and the significant 17.6% reduction in noseweight.